Washington DC: United States Supreme Court | Flickr - Photo Sharing! The Supreme Court Building, at 1 First Street, NE, is the seat of the Supreme Court, the highest judicial body in the United States. Designed by Cass Gilbert, the four-story Neo-Classical was completed in 1935 at a cost of $9.74 million. Prior to the establishment of the Federal City, the Court met in the Merchants Exchange Building in New York, and Indepence Hall in Philladelphia, when those citites served as the Capitol. After the federal government was established in Washington DC, the court met in various locations of the United States Capitol--shifting from a small basement room to the Old Supreme Court Chamber to the Old Senate Chamber. It wasn't until 1929 Chief Justice William Howard Taft argued successfully for the Court for the court to have its own headquarters to distance itself from Congress as an independent branch of government. The building, set on a trapezoidal plot behind the Capitol Building, is composed of three parts--a dominant Roman-inspired central spine with ornamented end porticos, conceived of as a temple of justice, flanked by two wide horizontal wings. The pediment on west façade, or main entrance, sculpted by Robert Ingersoll Aitken bears the motto "Equal Justice Under Law." The frieze is bookended by President and Chief Justice William Howard Taft on the north and Chief Justice John Marshall on the south. Next to Taft, the architect Gilbert converses with Secretary of State Elihu Root while the sculptor Aitken attends to Chief Justice Charles Evans Hughes. James Earle Frasers' allegorical figures, Authority of Law and Contemplate of Justice guard the temple entrance adorned with sixteen columns and eight pilasters. The east façade pediment, by Hermon Atkins MacNeil, bears the motto "Justice, the Guardian of Liberty," with representations of great law givers, Moses, Confucius, and Solon. John Donnelly, Jr., modeled the thirteen-ton bronze doors, each with eight panels derived from classical, historical and literary sources on th eleft, and Anglo-American legal history on the right. 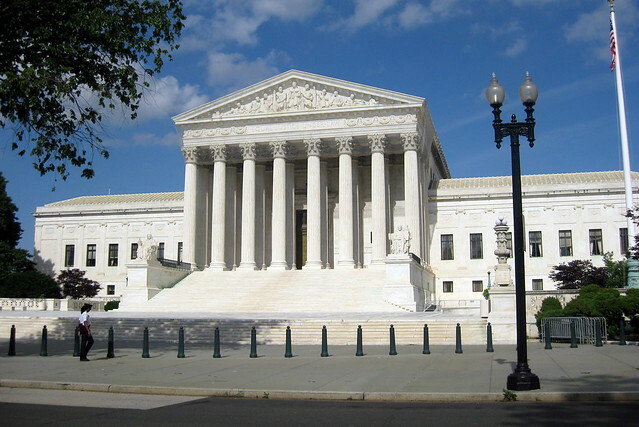 The Supreme Court of the United States is the highest judicial body in the United States, and leads the judiciary branch of the federal government. Consisting of the Chief Justice of the United States and eight Associate Justices, are nominated by the President and confirmed by the Senate to lifetime appointments, it serves primarily an appellate court, but it has original jurisdiction over a small range of cases. In 2007, The United States Supreme Court was ranked #15 on the AIA 150 America's Favorite Architecture list. catsbysue, Flo602012, josephhayes47, and 2 other people added this photo to their favorites. Hi, I'm an admin for a group called Neoclassical Architecture, and we'd love to have this added to the group!